DVD-Audio: Pentium III/AMD Athlon 1 GHz or faster processor recommended. Requires 256MB RAM and Windows XP (SP1), Windows 2000 (SP4) or Windows ME. Also requires a second-generation 6x or faster DVD-ROM drive. Experience the ultra-realism of environmental audio that only EAX ADVANCED HD effects can deliver. Enjoy dramatic 3D positional audio, sophisticated reverb effects, and up to 7.1 surround sound with over 400 existing 3D games. Encounter the superior quality of Advanced Resolution DVD-Audio in 24-bit multi-channel surround. Listen to all stereo recordings including MP3/WMA and CD music in compelling 7.1 surround. Dramatically enhance your music with features including Bass Boost, Multi-Band Graphic Equalizer, Audio Clean-Up, and more! Sound Blaster Audigy 2 Value features built-in Dolby Digital EX decoding to deliver captivating audio playback in 5.1, 6.1, or 7.1 surround with DVD movies. Pros: Had crackling problems with an old card and cutting sounds in and out in some games, Mostly San Andreas. Other Thoughts: why is there a crudload of applications?? Cons: If you own vista you won't get nothing more out of this card than a 1980's FM radio for sound. Creative isn't supporting this product like they should have by now..instead they are trying to patch a problem with ALchemy which the common computer user will never be able to figure out without a slid ruler. Other Thoughts: Creative is losing its touch for support.. if only there were other cards that did better. Pros: very nice card. works well with my 5.1 surround sound system. delivers crystal clear sound, very powerful subwoofer. Cons: be careful what kind of power supply you have for this! the one that i have is very sensitive, and even the slightest touch on the power cord with cause the sound to stop coming through... its very odd as a matter of fact. Other Thoughts: i wish this problem could be fixed, although it may be entirely the power supply's fault. but good shipping newegg! you rock! Pros: Once I understood how to install a sound card which I had never done before everything went great. It makes my Creative Speakers sound great. Cons: Why is so many apps included? Pros: Absolutly wonderfully. Comes packed with features and software. No problems what so ever. Cons: None. It worked great. Other Thoughts: I realized after buying this card that I didn't really need the difference. I hooked up my speakers to the onboard audio on my Mobo and it sounded exactly the same. My advice: unless you have the money to spend, are a dedicated gamer, or you got very good speakers, don't waste your money buying this. Pros: i replaced my busted realtek ac97 that made random snack crackle pop sounds at times and now its all perfect..
Other Thoughts: i wonder if the X-FI will be a worthy upgrade since i got this now, anyone think so or should i wait? Pros: Great sound card, it sounds the same as the audigy 2 zs that my friend has across the street. 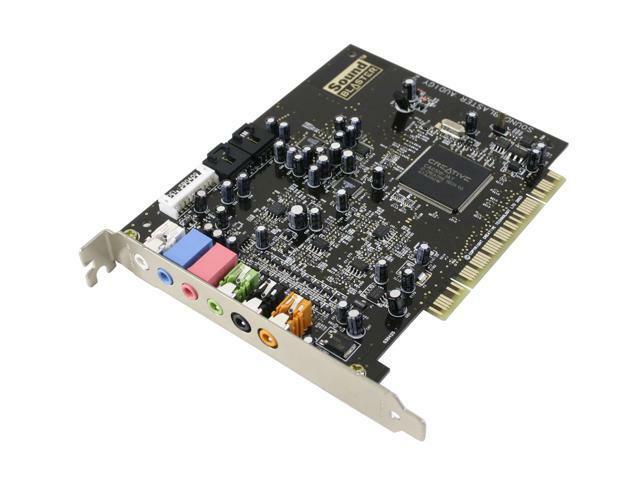 I bought this sound card at Office Depot, I just went there to look at graphics cards and this and it was only 17 dollars so i bought it. It came with Splinter Cell for free and the drivers it came with worked perfectly. If you play games where sound matters like counter-strike, do NOT play without calibrating the speakers, it sounds soo weird without calibrating it. Cons: The presets for the equalizer are bad! Make your own and make it look like -._.- and it will sound great! Other Thoughts: I dont use the EAX HD console so i cant say anything about that, dont waste more money on a ZS this one sounds the same. Pros: It's a sound card! Not just a bunch of line-ins & outs. Other Thoughts: Don't waste money on the cheepest soundcard, get this one. Or just stay with onboard sound.